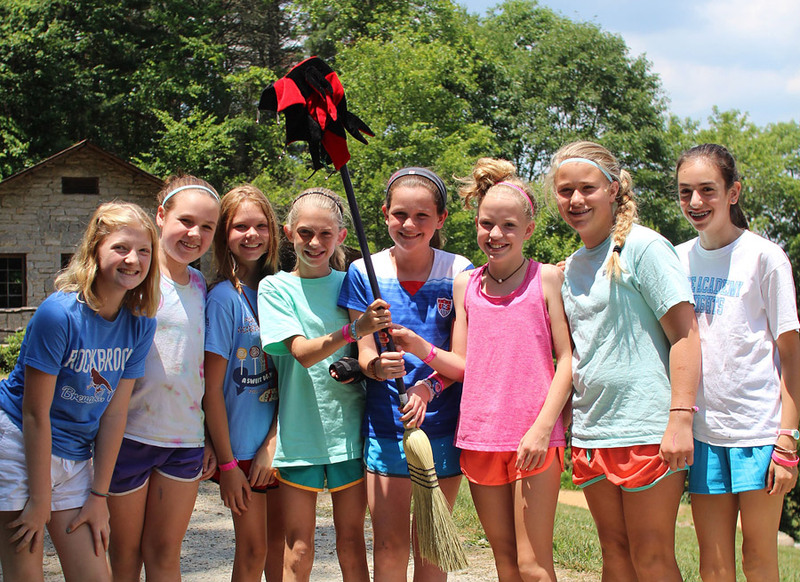 There are several all-camp events that close the main sessions at Rockbrook, and as we have finished today, we will have enjoyed them all. It’s important that these events involve everyone at camp because they represent the tight-knit community that has formed over the last few weeks, the feelings of camaraderie and appreciation we have for each other, and the unity gained from all of the moments— big and little —of shared experience during camp. 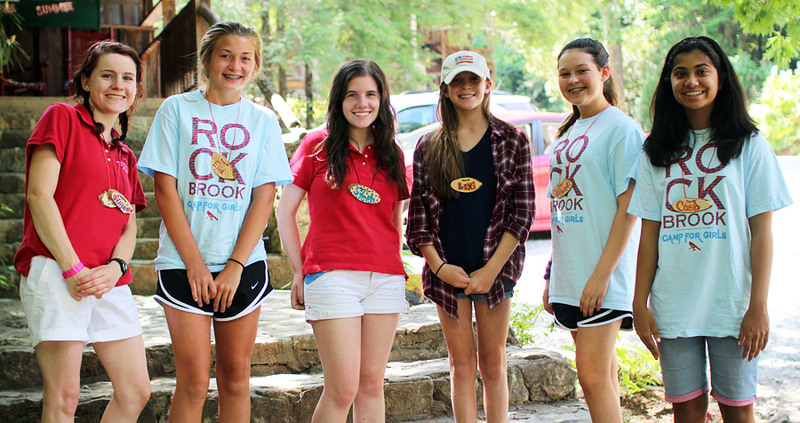 The community of Rockbrook has grown stronger during the session, and while you sense it throughout each day, these final all-camp events make who we are as a group even more clear. The “Banquet” is a great example. 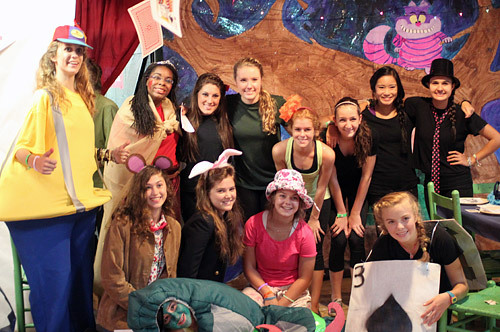 Our ninth grade girls, who we also refer to as “CAs,” are given the responsibility of planning our session Banquet, to select a secret theme, and then present an elaborate party based on that theme. 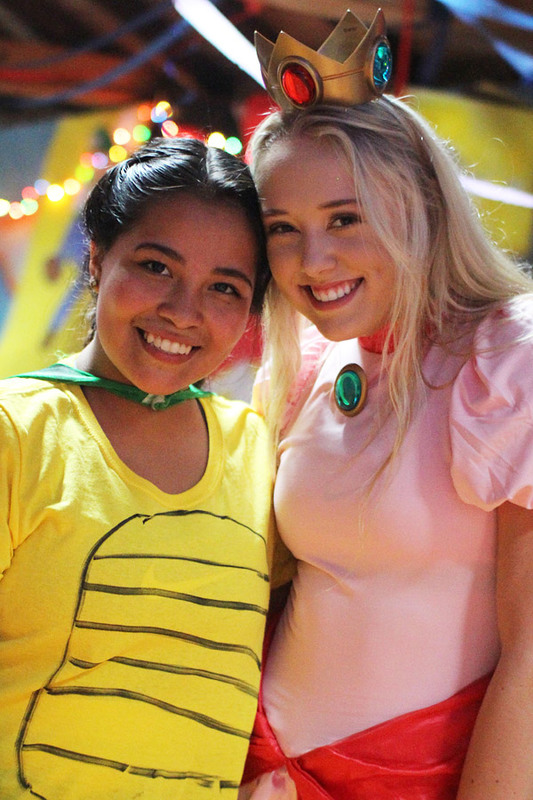 Special music, almost 100 different hand-painted posters along with other decorations, food to match the theme, plus dance performances and skits in costumes— all make the event. There are souvenir, decorated cups and printed programs on each table, plus, of course, lots of candy to assure it’s a “sweet” party. 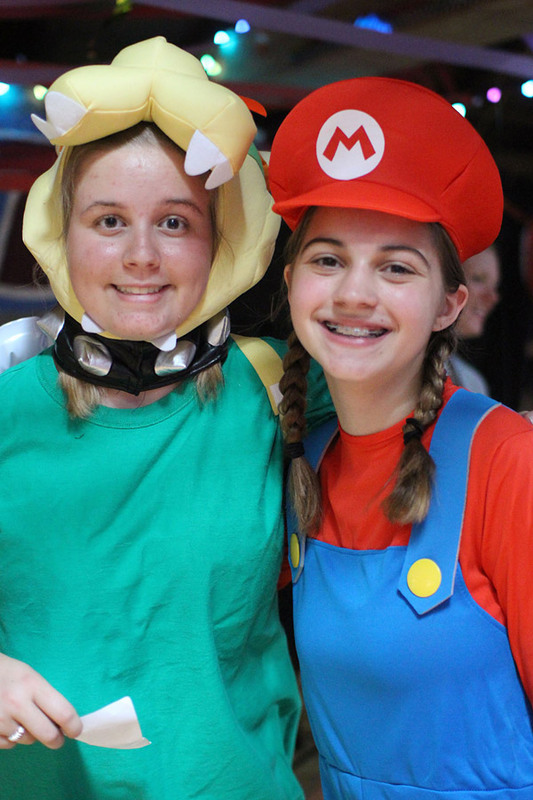 This session the CA girls presented a “Mario” banquet filled with characters from the Mario Brothers and Super Mario Nintendo video games. From Mario to Peach, Luigi to Toad, Donkey Kong to Daisy, there were colorful characters serving the dinner and performing several choreographed dances to some of the video game music. 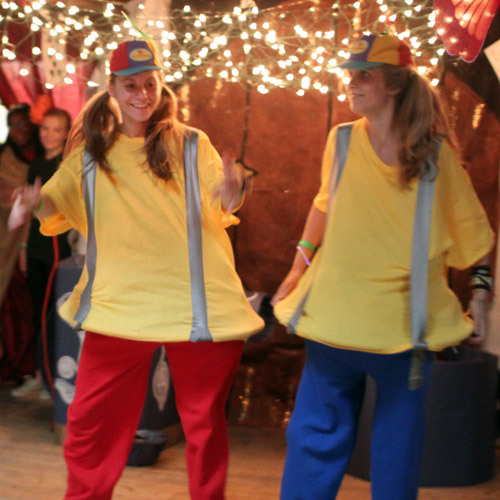 The campers, all dressed in this year’s RBC t-shirt, joined in several of the dances, turning the whole dining hall into a fun dance party. 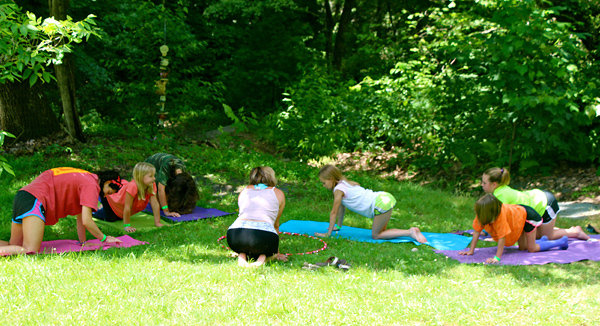 Occasionally pausing for a photo or a giant gulp of water to re-hydrate, all of us danced (laughed, smiled and jumped! ), sang (screamed and shouted! ), and ate (nibbled chicken fingers and fries, and chewed different candies!) together. We were hot and sweaty, but oh so happy having this much fun. 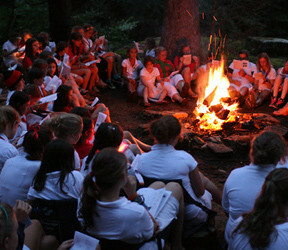 The closing campfire, what has been called our “Spirit Fire” at Rockbrook for 95 years now, is another example of an all-camp event that signifies the positive feelings of community we enjoy here. Different from the banquet though, this event is more reflective and carries deeper emotions. First, we hold it on the last night of camp. We all dress in our white uniforms. We sing our more traditional songs like “In the Heart of a Wooded Mountain” and “How Did We Come to Meet Pal” around the campfire. 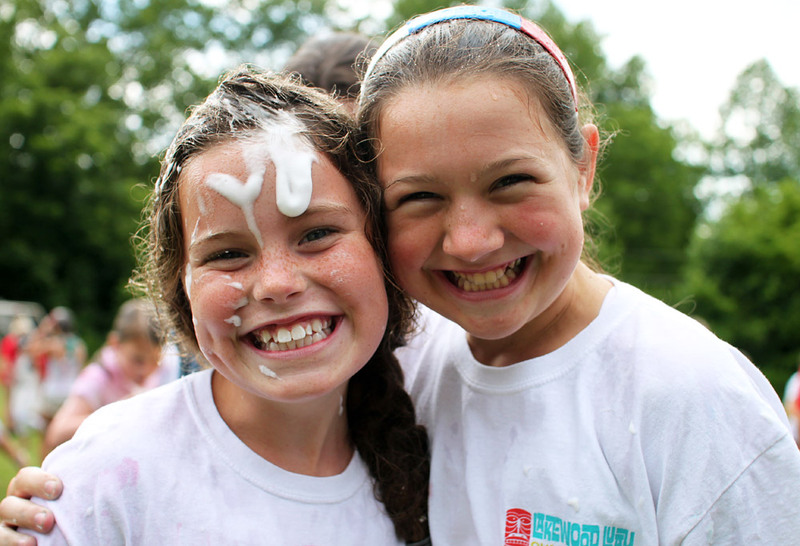 And we hear campers and counselors speak about their time at camp and what it’s meant to them. More than anything, the Spirit Fire is a beautiful reminder of the camp community and the very real feeling of being respected and loved by a group of friends. We’ve forged a collective spirit over these last few weeks, supported by kindness, cooperation and care, and bubbling with enthusiasm and encouragement. The Spirit Fire is simply a focused moment defined by that spirit. As we sit together around the blazing campfire, with stars above and the sounds of crickets and night frogs all around, it’s hard to not get a little teary. It’s a wonderful experience. It’s been a fantastic session… packed with action, and maybe a little too much singing and dancing, if that’s possible. Thank you for sharing your girls. We will miss them, and until then, look forward to singing and dancing with them again next summer. Today we proved it again. We proved one of the basic principles of camp, something that we know makes things better… more fun. It’s simply this; if it’s good to do something with a few people, it’s more fun to do it with even more people. Certainly there will be diminishing returns at some point, but generally speaking at camp our fun ramps up further when more kids join in. 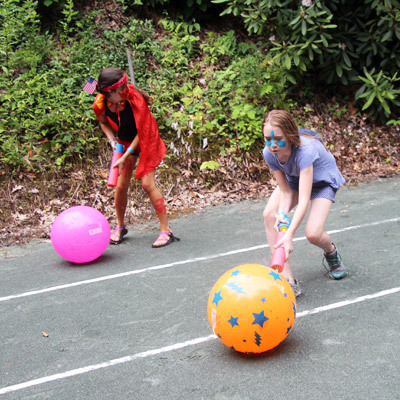 Games of Gagaball, swimming in the lake, making pottery, kayaking down a river, doing yoga, playing tennis, even relaxing in one of the red rocking chairs on a lodge porch— there’s more conversation, reward, emotion, silliness and fun when we do any of these (and other examples too!) with others. 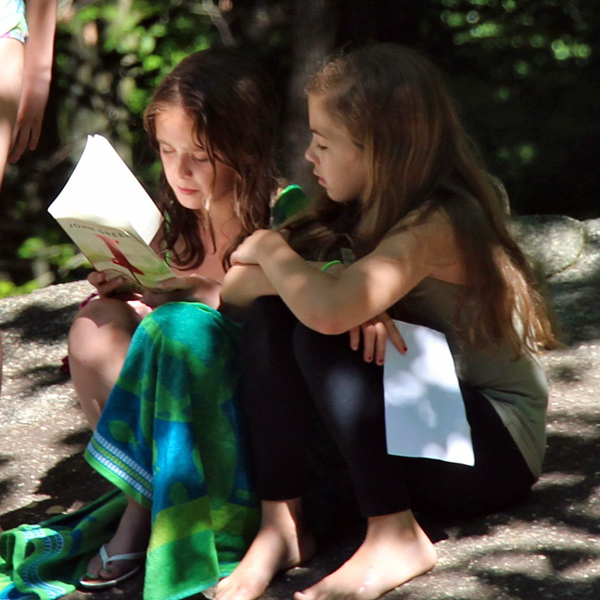 It’s an easy lesson to learn in a place so community-minded as Rockbrook. Being inclusive, friendly, open and generous, leans us all toward each other, encouraging more meaningful relationships. 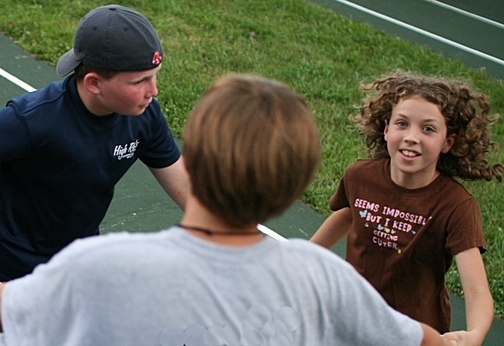 At camp we seek each other out, thrive inter-acting, and enjoy everyday with friends. Today’s proof came when 75 Mini Session campers arrived and joined the full session girls. 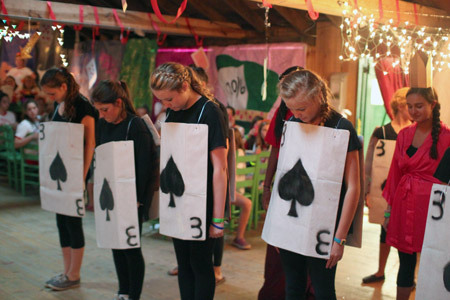 Right away, as cabins filled with new smiling faces and new wood-chip name tags were spotted around camp, it felt more festive. 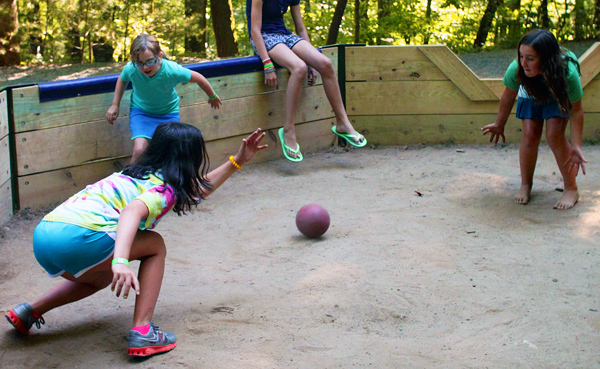 It took really no time for these new campers to jump right in, to be hiking, playing tetherball, tying their first friendship bracelet, and romping the hills of camp with their cabin groups. Just before lunch, we all gathered on the central hill of camp under the old walnut tree for an assembly. This is a gorgeous shady spot that looks out at the Blue Ridge Mountains in the distance, and serves as an amphitheater of sorts for us. 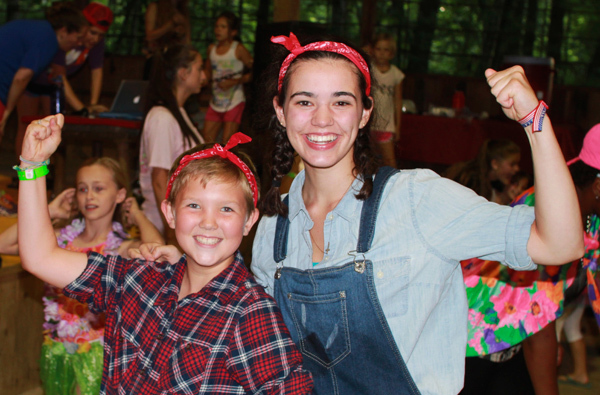 Sarah began the assembly by welcoming the new campers to Rockbrook and introducing the directors, special staff members, and head activity instructors. Then we all felt the power of the added enthusiasm provided by these new campers when the Hi-Ups, the oldest girls, led the camp singing the different “Line songs.” Part song and part cheer, I bet folks all over the river valley could here us! The best proof came after rest hour when the counselors set up a crazy obstacle course for the campers. We warned them to dress in swimsuits because they were apt to get hot and wet running to each station, challenge and obstacle. 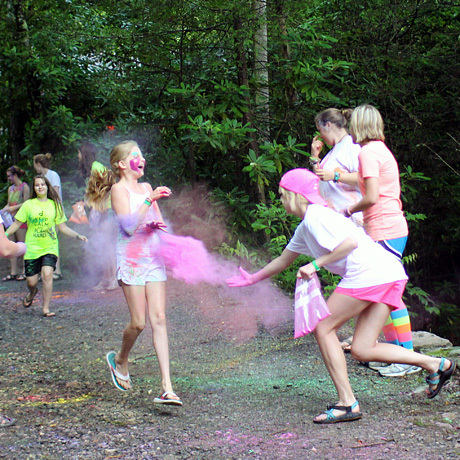 Some of these were a little messy, like the color run where blasts of colored powder and water balloons (thrown by a couple of counselors) blocked their path, or the “noodle crawl” that had the girls duck under a net and crawl through an area of wet noodles. Other obstacles were physical, like weaving through a maze, jumping over bales of hay, and stepping from stone to stone along the path. 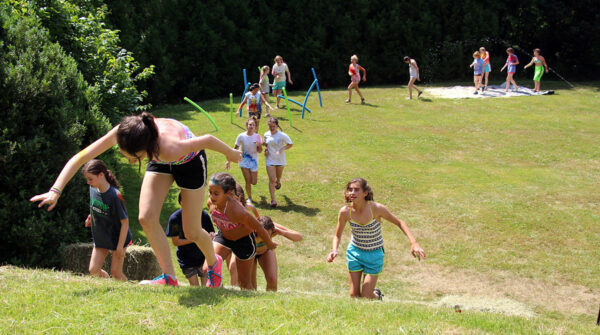 The obstacle course ended at the landsports field where we had an inflatable water slide and a huge dance party. Snow cones and chilled watermelon, plus lawn sprinklers and an army of counselors armed with water guns, helped keep us cool in the afternoon sun. 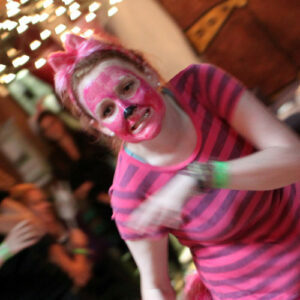 Face painting, hula hooping, corn hole games, and loads of dancing added to the fun. 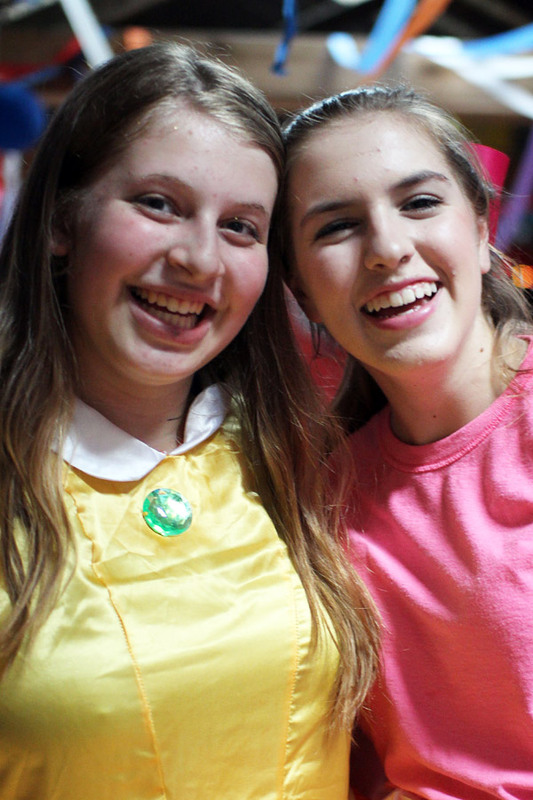 Karin and Abby, two of our camp photographers, caught most of the action, so be sure to check out the photos in the online gallery. You can tell by all the faces, the fun was multiplied. Good active, messy, fun. You know it’s been a great camp day when everyone in camp needs a shower before dinner! We don’t take the 4th of July lightly around here. In fact, it might be the peak of the summer, combining everything we love about Rockbrook and then pushing it just a little higher, adding a tad more intensity, and turning up the volume… all, of course, just for the fun of it. We began the day early, before the regular rising bell, like camp has for decades on the 4th, with the equestrian staff riding down the cabin lines shouting, “The British are coming!” The staff had braided red, white and blue ribbons into a couple of the horse’s tails and one had a small flag fixed to its saddle. As the campers woke to the sounds of hoof beats outside their cabins and all this strange yelling about “the British’ (which by the way, Paul Revere probably called them the “Regulars”), they stumbled out onto the hill, still dressed in their pajamas, for a flag raising ceremony led by the Hi-Ups and everyone reciting the Pledge of Allegiance and singing America the Beautiful. At breakfast, the campers were met by the first wave of decorations meant to help celebrate the 4th of July. The dining hall had streamers, posters, ribbons, and balloons hung in every direction. 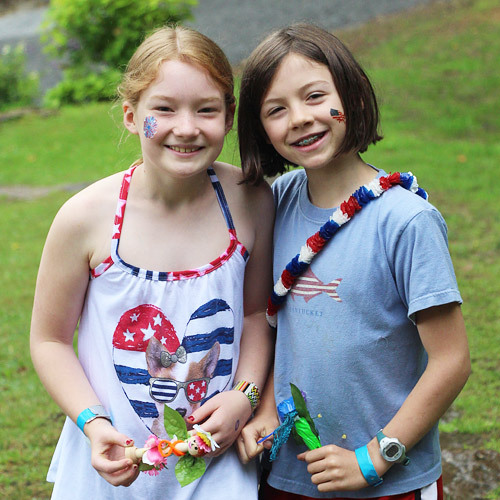 We set a pile of red, white and blue head bands, stickers and temporary tattoos on all the tables, and combined with the campers’ own festive shirts, tights, and hats, the patriotic color scheme was elaborate, to say the least! 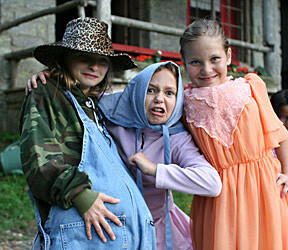 Rick had eggs, sausage (veggie too) and oven roasted red potatoes for breakfast, and after singing several songs like “Yankee Doodle,” “Your a Grand Old Flag,” and Katy Perry’s “Firework,” the girls were definitely in the spirit of the day as they set out for their morning activities. For the afternoon, we scheduled a fun, exciting series of all-camp relays that ran the campers in stages between the Alpine Tower at one end of the camp to the Landsports field to finish up. 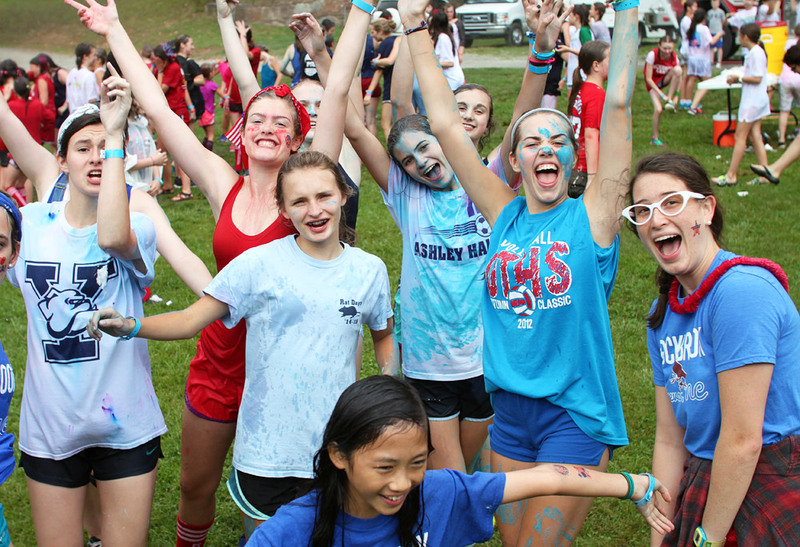 Part group games, part physical tasks, and part cooperation relays, the entire event challenged three teams (red, while and blue) comprised of girls mixed from all three age groups. 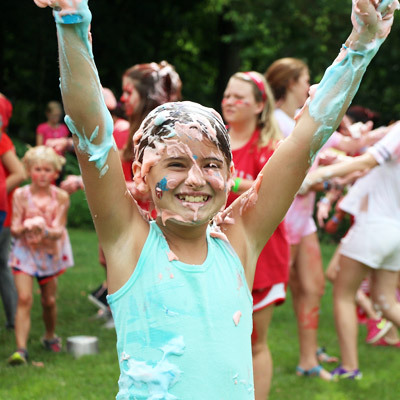 Each team started by dressing and decorating themselves with washable body paint in their team color, and by creating a team cheer. Also, all the girls on each team selected an individual relay, a particular challenge to tackle and advance their team toward the finish. There were 17 (!) different relays in all, so everyone had a role to play for their team. There were traditional relay race events like Dizzy Lizzy, Greasy Watermelon, Sponge and Bucket, 3-legged, and Egg and Spoon, but also silly challenges like moving marbles from one bucket of water to another using just you feet, and passing a banana backwards down a line of people lying on the ground, again using just your feet. 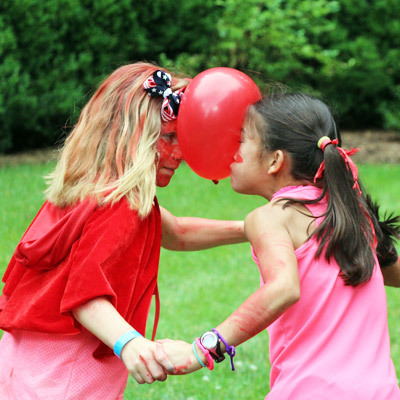 One game used water pistols to roll a beach ball, another challenged the girls to sidestep while holding a balloon between a partner’s head, and still another required the group to thaw a frozen t-shirt as fast as possible. Dashing from relay to relay, the girls were so excited to finish their event and then cheer on their teammates as the mob grew larger the closer it got to the Landsports field. There we had music and watermelon to enjoy while the final events completed. We had a pie eating contest, and a crazy red, while and blue shaving cream fight at the end of the afternoon. But as a final surprise, Richie, Rockbrook’s builder and facilities manager, arranged to have a firetruck ready to spray a huge fountain of water up in the air. Instant rainstorm! 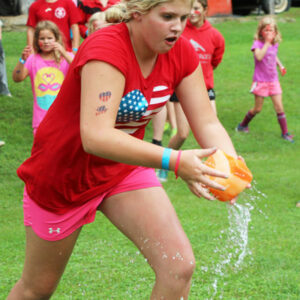 With fun, danceable pop music blasting, the girls sweaty and messy from the relays and shaving cream, they had a complete blast together dancing around as the fire hose showered water. Almost unimaginably, it was a moment of sheer joy for everyone. After cleaning up, we all enjoyed a traditional picnic on the hill, a yummy supper of grilled chicken breasts, baked beans, corn on the cob, and potato chips. We don’t serve soft drinks at camp ordinarily, but tonight we offered the girls each a can of Cheerwine, kept cold in the creek in front of the Goodwill cabin. For dessert it was shortbread, strawberries, blueberries and fresh whipped cream— red, white and blue.. again! As night fell, the finale of the day was our own fireworks show. Chase was ready with glow sticks for all the girls and a playlist of fun music to blast during the show. For the next 35 minutes, we all enjoyed another dance party, as the girls twirled their glow sticks, sang along to the music and cheered with every sparkling blast in the air. It’s hard to beat a day like this with one celebration after another, one exciting surprise after another. When you have all these great people having this much crazy fun, I can’t think of a better way to spend the 4th of July. 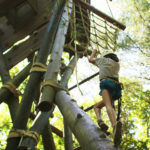 Out in the woods behind our gym, a 50ft tall, high ropes climbing tower, our “Alpine Tower,” sees daily action. Campers can sign up to climb it (or the climbing wall in the gym if it’s rainy) as one of their 4 activity periods. 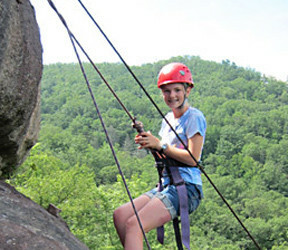 It provides the perfect introduction to rock climbing because it introduces girls to the same equipment (helmets, harnesses, locking carabiners, and kernmantle ropes) and techniques like belay commands, knots, footwork and balancing principles. 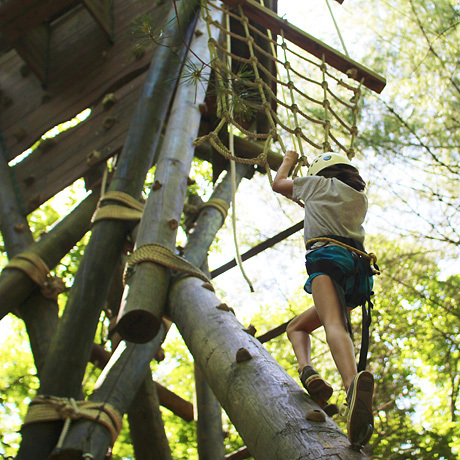 The tower is triangular with three sides each with different obstacles and climbing challenges, so three girls can climb on it simultaneously. Also, each side presents dozens of different routes to the top making it easy to find a find challenge each time you climb. The are swinging logs, cargo nets, overhanging walls, dangling ropes, parallel posts, and of course all different sized handholds, all requiring a different move to reach the top platform. 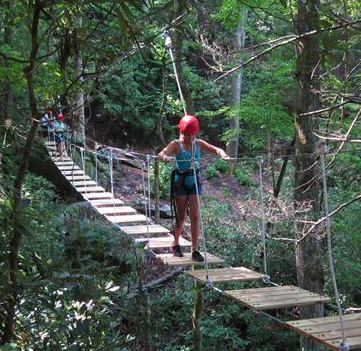 Once they make it up, the girls enjoy a tree-top view before being gently lowered down on their belay rope. Transylvania County, where we are located, dubs itself the “Land of Waterfalls” because there are hundreds nearby created by the many creeks and streams tumbling off the mountains over enormous rocks. Over the centuries, many of these waterfalls have created beautiful pools of water below that provide a fantastic experience for a brave swimmer. It takes a little courage to swim at the bottom of a waterfall. The churning foam looks intriguing, reminiscent of a hot tub, but the crashing sound and slapping force of the falling water conveys a special power that must be approached carefully. The water pushes you around. Also, it’s no secret that the water around here is brisk… or let’s call it “refreshingly nippy,” and nothing like a hot tub. 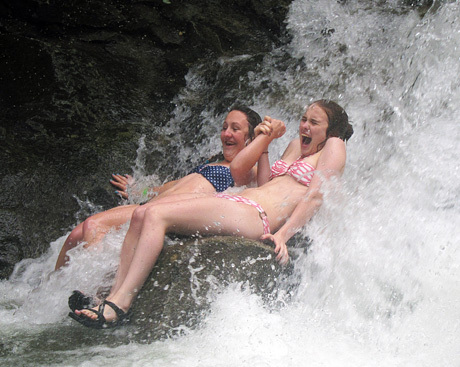 The exhilaration of the water temperature and the intensity of it pounding all around you, is a huge thrill. 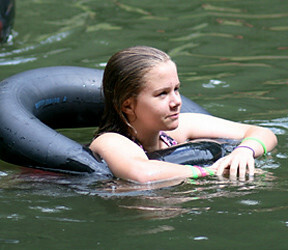 The Hi-Ups (our 10th grade campers) experienced this today when they spent the afternoon at one of our favorite swimming holes. Did they scream? Oh, yes. Was it awesome fun? Definitely. 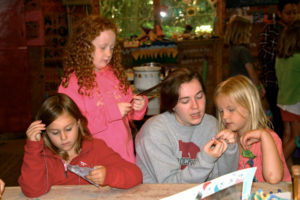 Our evening program tonight was a special all-camp event that was surely a unique experience for the girls. It began with a “color run.” For those interested (it was fine to opt out), they put on an old t-shirt and ran through a gauntlet of counselors armed with brightly colored, powdered paint (non-toxic of course). 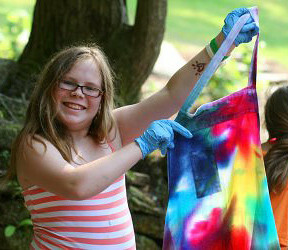 After a little spray of water at the start, the paint stuck to the girls giving them an colorful, tie-dyed look. This led them down to the gym of a color paint dance party put on by our favorite local DJ Marcus. We passed around glow sticks and used even more colorful glow paint and face paint to magnify the colorful dance lighting Marcus included in his show. This was all so much fun! The girls laughed and played for 2 solid hours, pausing for photos, showing off silly dance moves, and signing along to their favorite pop songs. 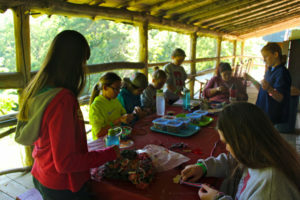 With no boys around and everyone, counselors and campers, so fully engaged, they felt even more at ease and willing to be painted. Be sure to check out the photo gallery of this event to see how much we all enjoyed it. 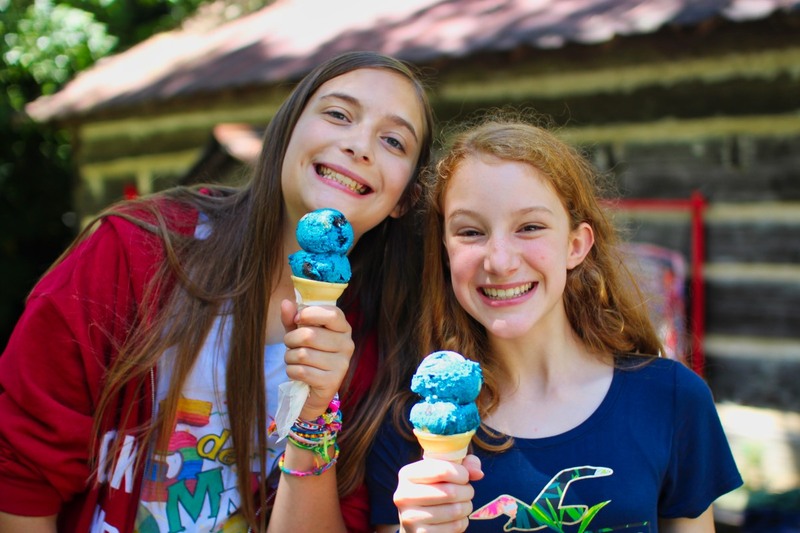 The end-of-session Banquet is a huge deal at Rockbrook, something that everyone, from the youngest first-time camper to the most senior staff member, looks forward to. The element of surprise drives this to some extent, since the Banquet’s theme is kept secret, but it’s also a marvelous experience to attend, one filled with colorful wall panels, table decorations, choreographed dancing by live characters, special food, and dance music. 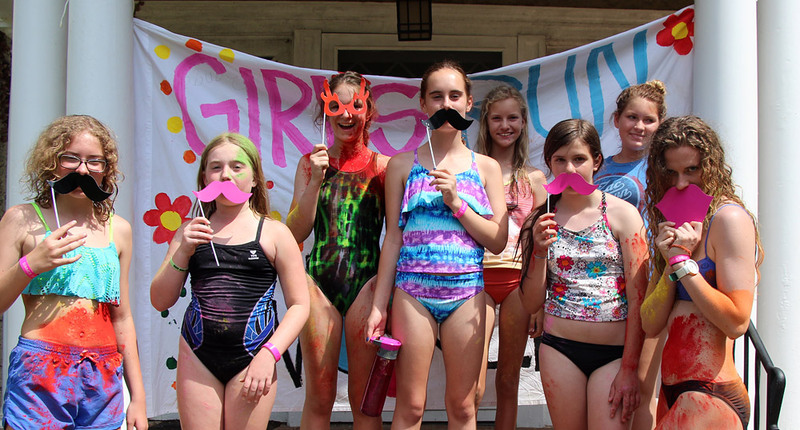 The planning for each session’s banquet begins long before the girls arrive at Rockbrook. 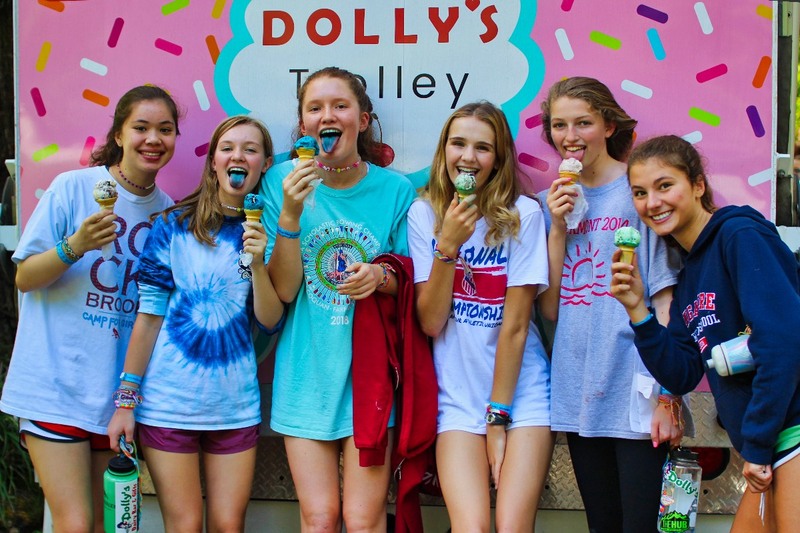 In fact, for girls who attend camp every summer, it can be a topic of discussion years before they even become “CA” campers, 9th graders, the age-group given the task of presenting this end-of-session party. Many of these girls have grown up attending RBC Banquets, seeing what the CAs before them have done, so when it’s their turn, they are full of ideas. 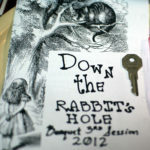 The CAs this session decided to make their banquet an Alice in Wonderland theme, titling it “Down the Rabbit’s Hole” and featuring decorations and characters based on the well-known novel by Lewis Carroll, and the Disney animated film adaptation of the book. The decorations were phenomenal! Every wall of the dining hall was covered with a unique poster painted with a scene of character from the story. There were over-sized and regular playing cards hung among strands of lights, curtains, and fabric. 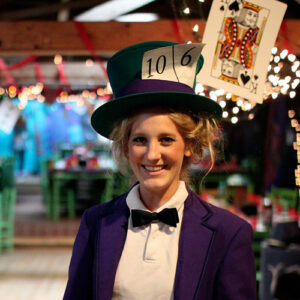 On each table, there were paper mushrooms, plenty of candy, more playing cards, top hats, small bottles of bubble solution, and souvenir red cups. 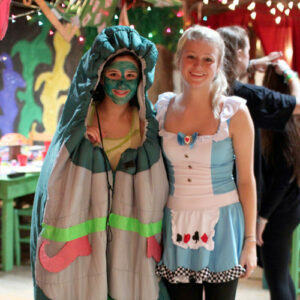 Here’s a short video to get a sense of the detail of these decorations and the amount of time and energy it took these girls to paint and set up the entire dining hall. The costumes were amazing as well. Several of the counselors dressed as main characters: Alice, the White Rabbit, the Cheshire Cat, the Mad Hatter, and the Dodo Bird, while the campers became Tweedledum and Tweedledee, the Caterpillar, the King and Queen of hearts, the Door Mouse, and the March Hare. The combined effect of these characters greeting the campers as they came through the red curtain into the now unrecognizable dining hall was magical. The girls, especially the youngest Juniors, had such looks of astonishment when they first realized the theme and took everything in. 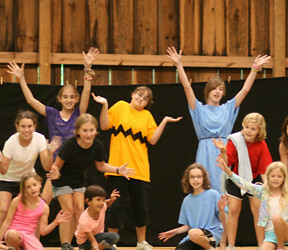 The program included a series of skits and dances enacting scenes from Alice’s adventures alternating with courses of food. 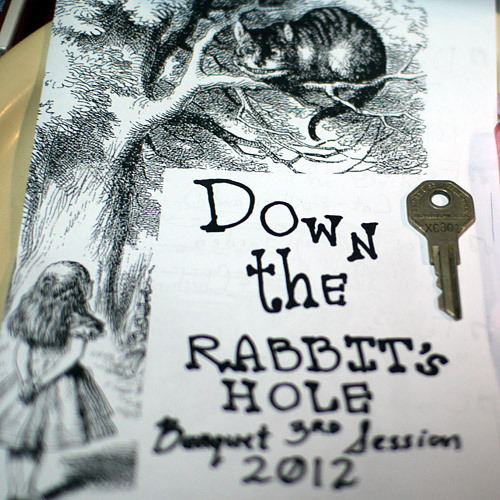 They served chocolate chip scones after Alice descended the Rabbit’s Hole and met Tweedledee and Tweedledum, cheesy bread sticks after the Cheshire Cat appeared, and fancy small sandwiches when Alice saw flowers dancing in the garden. Cupcakes decorated like mushrooms topped off the meal, followed by cards dancing with the Queen of Hearts. 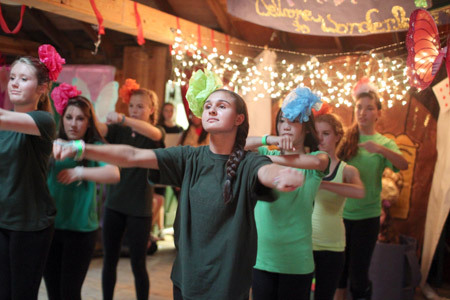 In between program events, the campers, all dressed in this year’s RBC t-shirt, were invited to get up and dance to some of there favorite pop songs from the summer. “You always remember your first Banquet,” a couple of Seniors told me today. And everyone agreed after tonight’s; this was one of the best banquets that everyone here won’t soon forget. It was awesome. Thank you CAs for all your hard work! 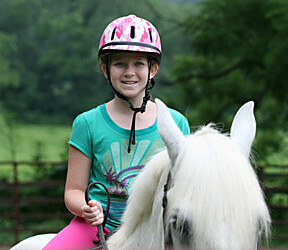 This is the first of two days we have at camp between the July mini sessions. Still in camp we have the 4-week main session girls, the campers who stay at Rockbrook the longest. 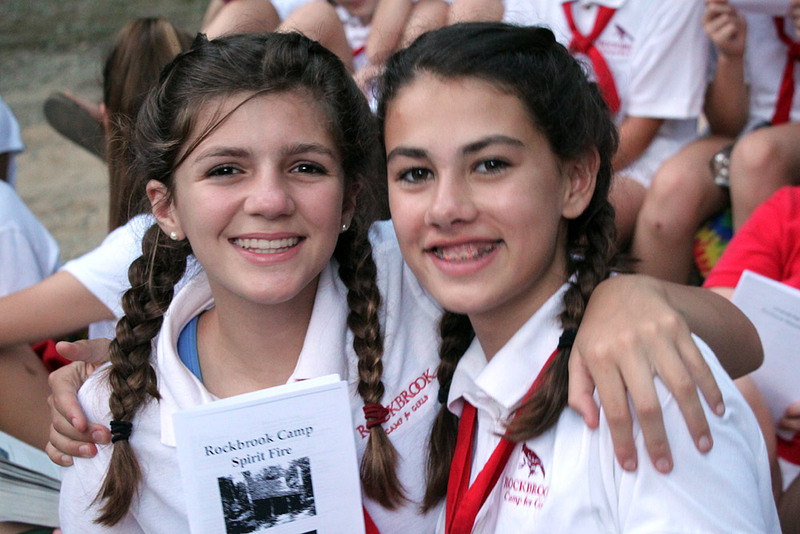 These are the full-blooded Rockbrook girls, often the veterans who are almost delirious with camp spirit. These girls spend the most time together, intensifying the whole experience, but also cementing even more indelibly the feeling they have for each other and the personal growth that follows. This group is also smaller, a subset of the full camp when the mini session girls are here too, which focuses the sense of community we enjoy here. It’s very much like a family in this way, all of us knowing and caring for each other in extraordinary ways. I say this a lot, but it really is a special thing. 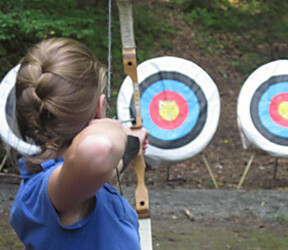 Being at camp longer also allows these girls to try more things and experience everything our activities have to offer. 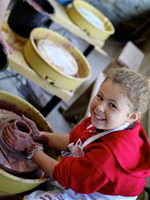 They can dig deeper into the ceramics program, for example, and work on throwing pots on the wheel. This is a skill that takes both good instruction and patience when practicing. 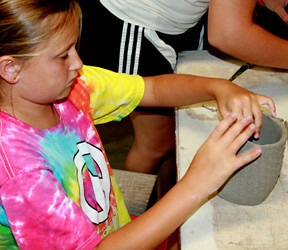 It can be frustrating at first, disasters like a crumpled or collapsed bowl being pretty common, but with time and persistence, we’ve seen real skills develop. 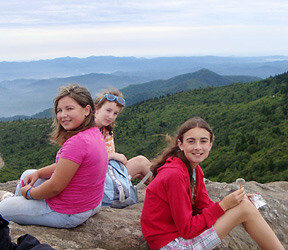 Staying longer at camp often inspires girls to take more advantage of the adventure trips we offer too. Sometimes with all the action at camp and a limited number of days to “spend,” it can be hard to devote a whole day away canoeing, backpacking, or rock climbing. 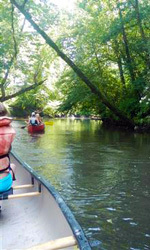 Today, for example, a good group of girls decided to join a canoeing trip down the French Broad river. 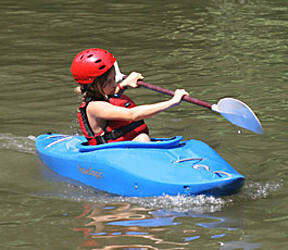 They had a great time paddling down a new section of the river, stopping to swim and explore. 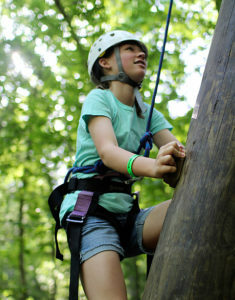 We also opened up the zip line course to girls today, giving them a yet another chance to fly across the back of camp. 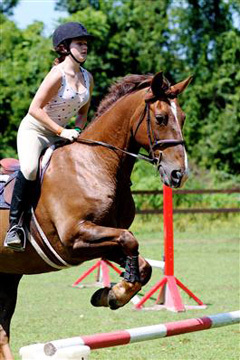 From trips down the water slide, to climbing Castle Rock, to jumping horses down in the riding rings, camp was delightfully busy, yet more relaxed than ever. 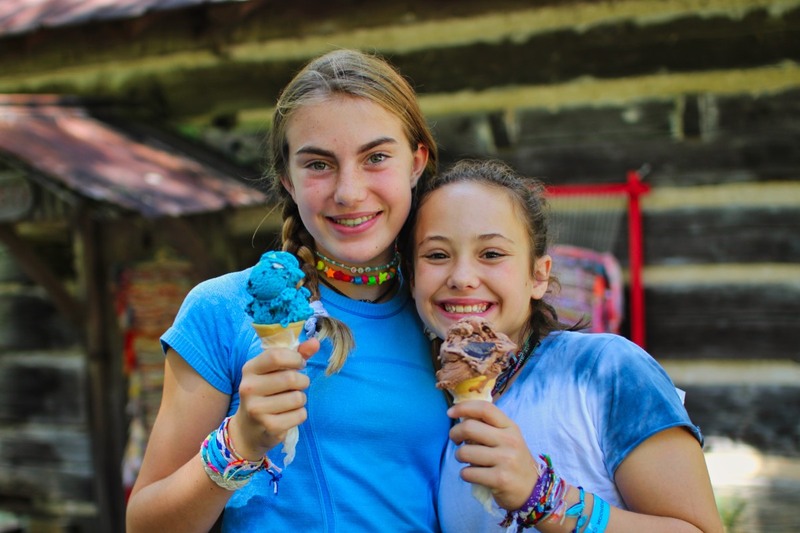 Part of the recipe that makes Rockbrook a “place of their own” for our campers is the free time they enjoy each day. There are three blocks of time, before lunch, and both before and after dinner (the two “free swims” and “twilight”), when there are no required, scheduled activities. 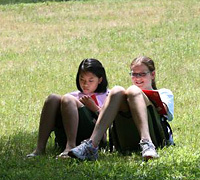 Instead, the girls can decide for themselves how they might spend that time, perhaps hanging out with their friends, finishing a craft project, exploring the creek by “Curosty,” writing a letter home, playing tennis, chatting with a counselor, or just reading under the big walnut tree on the hill. This is important because the rest of the year is often so tightly scheduled for kids, with school, sports, and other commitments keeping them on the run from one thing to the next— at an almost “job-like” pace. 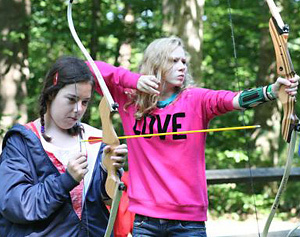 Thank goodness for summer and for camp when our girls can pursue their own interests, at their own pace, and develop their own sense of fun. Of course, it’s pretty easy to enjoy this free time when they are surrounded by the natural beauty of Rockbrook, have tons of good friends to do things with, and can turn in almost any direction for an idea or option to try. But getting in the habit of independently “finding something to do” is a great skill for kids to develop, and something that will certainly help them throughout the year. 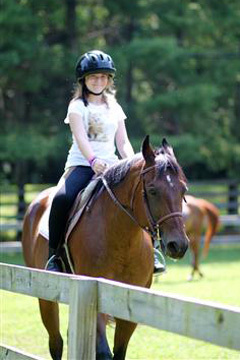 The fantastic weather we’ve been having these last few days has kept the equestrian staff happily working hard with lessons every activity period. 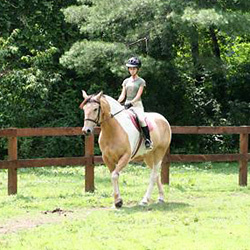 Some of the afternoon lessons were rained out earlier in the session, but no longer, and there are some great riding skills being shown in the rings. 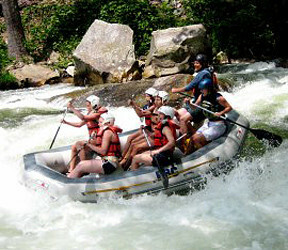 Likewise, we’ve been sending out a lot of adventure trips this week… kayakers to the Green River with Clyde, the Hi-Ups to Dupont Forest for waterfall hopping with Jeff, and shorter day hikes to Rockbrook Falls and Castle Rock with Michelle and the other outdoor adventure staff counselors. 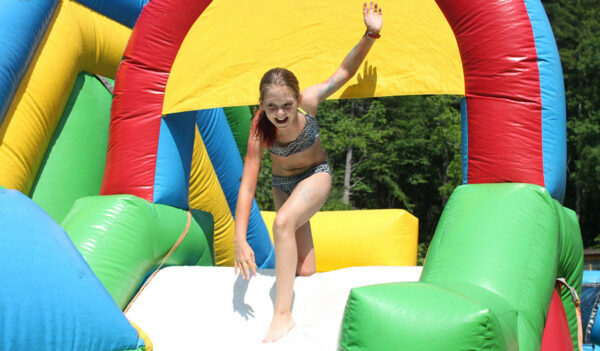 These warm and sunny afternoons have also made the lake a popular place to be, and it seems like there are a bunch of girls trying to set a record for trips down the water slide. 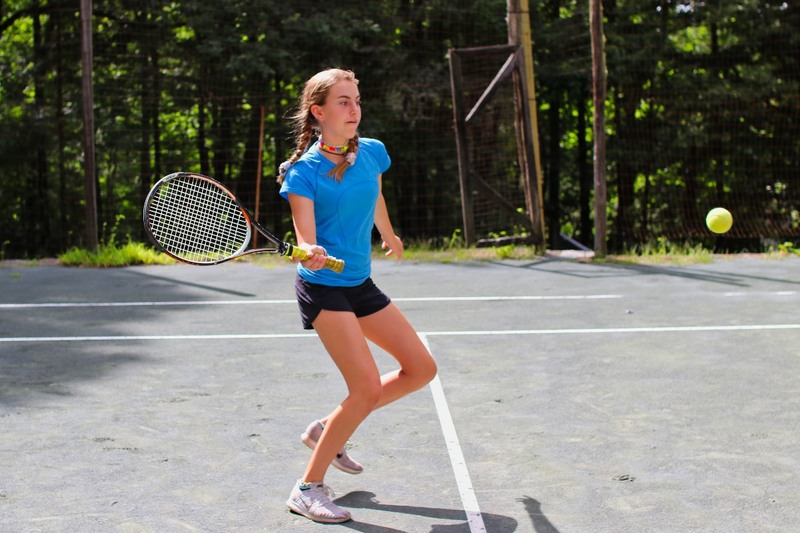 Add to that all of the regular sports going on— tennis, archery, riflery, gymnastics, alpine tower climbing and gym games —and there are a lot of sweaty girls heading to the lake for the second free swim before dinner. 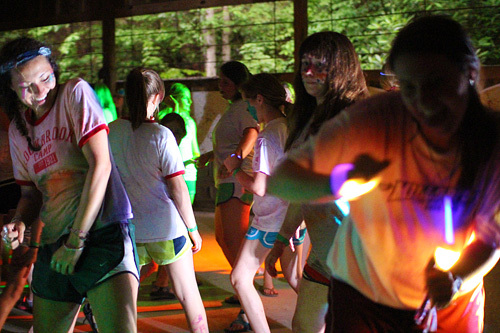 Tonight after dinner is was time for Disco Mania, a 70s dance party for the whole camp down in our gym. 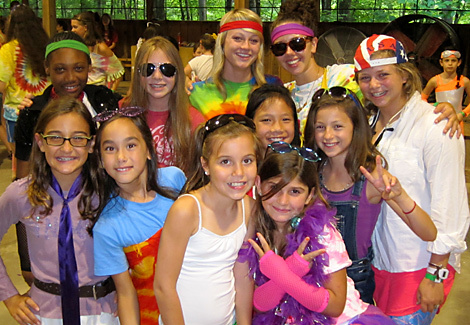 When the word went out to dress up (naturally), the campers and counselors started showing up in their best 70s garb. A few bell-bottoms and platform shoes really set the tone, but we also saw plenty of tie dyes, bright colors and sun glasses. Basically, wearing anything crazy seemed about right. With pumping disco beats, everyone really danced. Donna Summer, the Bee Gees, Blondie, Roxy Music, Diana Ross, and the Jackson Five all made an appearance on the playlist. 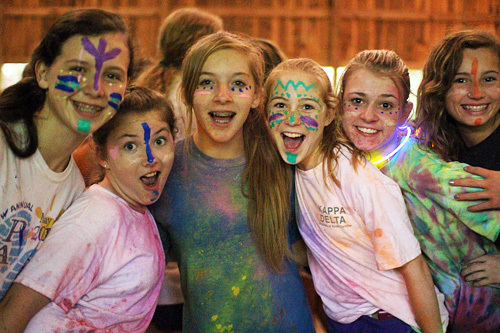 This was all Rockbrook, all girls (no boys), and definitely all fun.